Creative entrepreneurs know that inspiration can be sparked by big ideas or profoundly simple realizations. The spark of inspiration can be lit by being in nature or while communing with your adoring pet. Sometimes it’s other people who light the spark, and sometimes it’s their personal story. This past week, I was hugely inspired by Seattle Fashion Designer Luly Yang‘s story. Chances are very good that you’ve already seen Luly’s now-famous monarch butterfly dress somewhere in social media in the past few years. I had admired the dress every time I saw it, but eventually began to wonder about who created it and the inspiration behind the dress. I decided to research the dress and it’s maker, and found tons of pictures online but very little verifiable information. 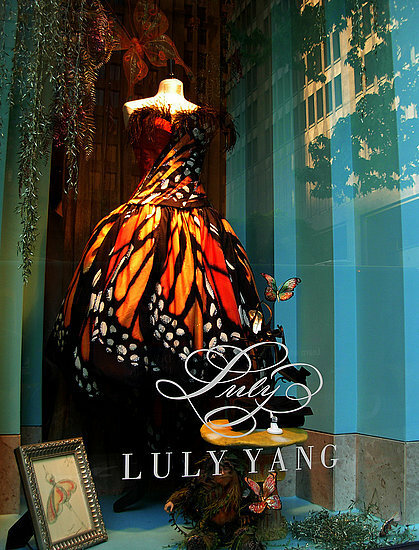 Eventually, I saw the name “Luly Yang” in one of the window photos and found the site for this Seattle fashion designer. Luly Yang is now a well-established fashion designer in Seattle, whose iconic robin’s egg blue storefront windows inspire everyone who sees their elegant dressings. But that wasn’t always the case. Reading that Luly had started her career as a graphic artist caught my attention. How does someone go from creating 2 dimensional graphics to designing stunning couture gowns? When people shift careers like that, it fascinates me! There must have been a creative spark in her to also work with fashion because Luly entered a paper dress contest in the year 2000. The idea was for contestants to design and construct a unique dress using only the paper provided. From this creative challenge, she designed and made the first monach butterfly dress in paper (see right). Think about that…how often do you see a blank piece of paper and see a beautiful dress? While that dress is stunning to behold, it is not really ‘wearable’. So, Luly eventually recreated the design in fabric (including silk taffeta, black ostrich feathers, and Swarovski crystals), as shown in the storefront photo at top. Neither the paper dress nor the fabric version is for sale, but serves as a fantastic icon for Luly’s brand. 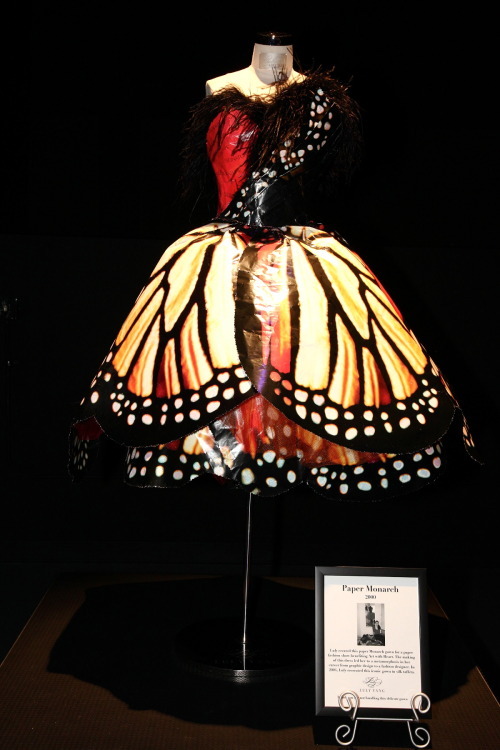 Luly has been quoted as saying the Monarch Butterfly Dress represents her metamorphosis from graphics to fashion design. What a transformation it has been! While you can still clearly see the graphic influence in her couture gowns, she is regularly sited among the top business inspirations in Seattle and awarded for her exquisite designs. Reading Luly’s story inspired me on many levels: that she started out in a field similar to mine, how she made a successful career transition, as well as finally knowing the story behind the beautiful butterfly dress. What has creatively inspired you recently? Next Next post: Why do Solopreneurs Need a Professionally Designed Website?